Along the famed “Banana Pancake Trail” through Southeast Asia, there are a few legendary stops for those looking to get wild – the Pub Street in Siem Reap, in the tubing in Vang Vieng, and last but not least, the Full Moon Party on Ko Pha-Ngan. Legend has it that the lunar bash started back in the 80s with a group of backpackers, a few guitars, and a campfire. My how things have changed in a few decades! Read on for a Gypsy Guide to the Full Moon Party. Location of the party and our recommended hotel on the map. It’s lunacy on Haad Rin. 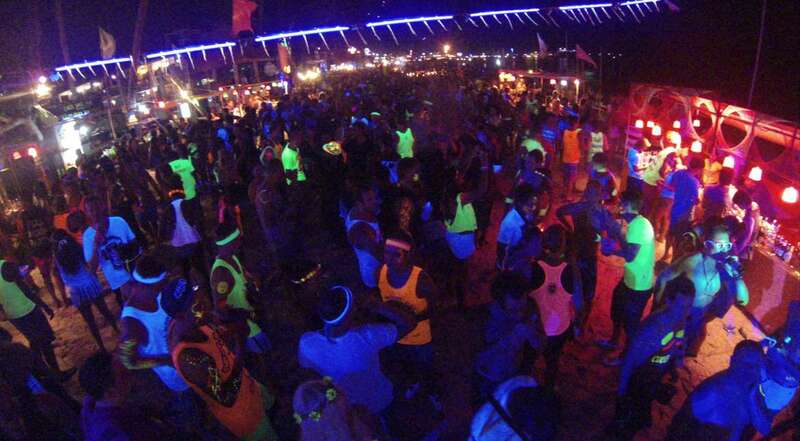 The party now regularly attracts upwards of 30,000 people who descend on the beach of Haad Rin to cover their bodies in Day-Glo paint, drink whiskey out of buckets, and dance in the sand. You won’t find many acoustic guitars these days; rather, dozens of DJs set up at the countless bars across the long beach spinning a variety of electronic music. The fire is still there, but not exactly campfires – you’re more likely to see people spinning poi or taking part in fire limbo and/or jump rope. At such a massive, famous party, it’s easy for things to go wrong. Every month, there are injuries, arrests, robberies, assaults, and unfortunately sometimes even deaths. 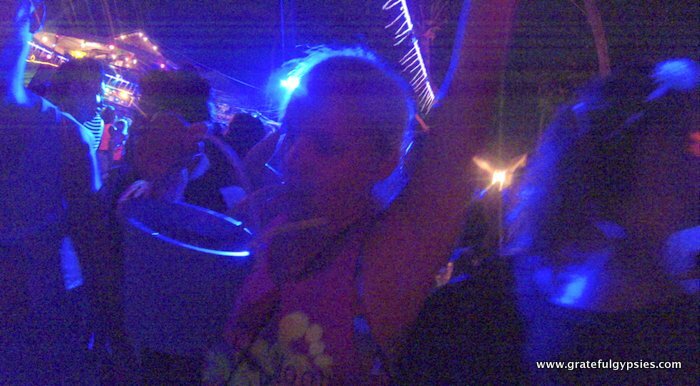 That being said, there’s no reason you can’t go to the Full Moon Party and still have a good time. 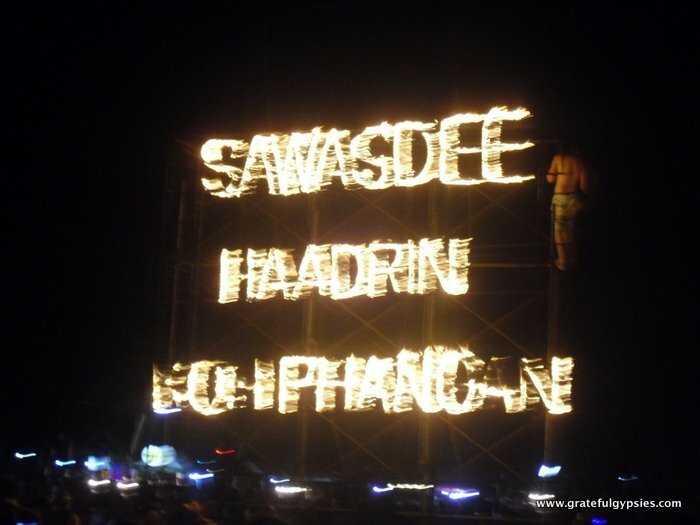 Having been to two of them – one where we didn’t really enjoy ourselves and a second time which was much more fun – we’ve decided to compile a guide of how to have an enjoyable Full Moon Party. Follow these ten steps and you’re sure to enjoy the lunar bash. The party goes on at Haad Rin beach, which means nearly 30,000 people – most of them heavily intoxicated – are going to be there all night. If you’d like to be able to leave the party at some point and actually sleep a little, this is not the place to stay. Plus, most of the accommodation in Haad Rin seriously inflates their price and requires long minimum stays around the Full Moon Party. Finally, break-ins are the most common in this part of the island, as local thieves know that people will be out all night and most likely returning seriously inebriated. 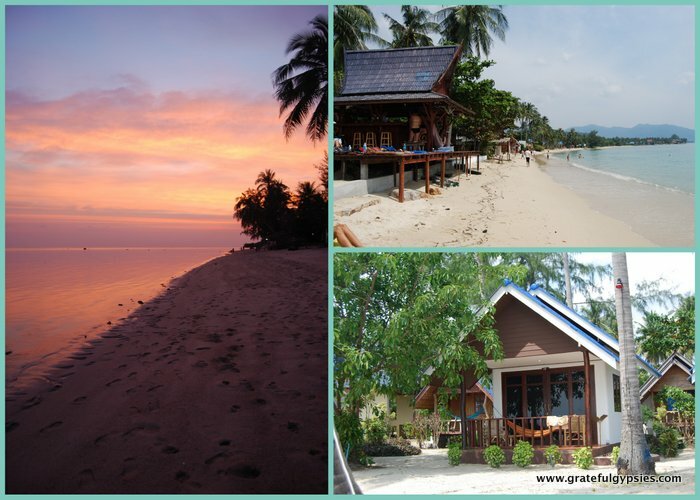 Both times we’ve attended, we stayed at Coco Garden Bungalows up on Baan Tai beach. It’s not far from the party, tuk-tuks are readily available, the prices remain the same, and it’s nice and quiet when you get back at an ungodly hour. Save the buckets for later. You’re on a tropical island getting ready to go to one of the most famous parties in Southeast Asia. Naturally, the temptation is there to start the party early. Before you start downing piña coladas, though, keep in mind that the Full Moon Party really doesn’t get kicking until after midnight and many stay all night to watch the sunrise. If you really want to enjoy the party and be present for at least some of it, wait until the sun goes down to start partying. I recommend casually sipping a few beers and alternating with glasses of water. That way you’ll get a little pre-game buzz on but still remain hydrated. There’s plenty of drinking to be done when you get down to Haad Rin. One bucket too many for this guy. 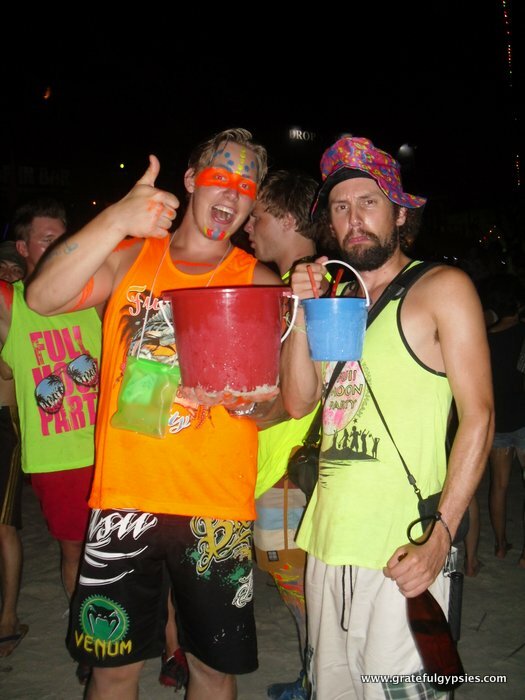 The drink of choice at the Full Moon Party is without a doubt the classic “beach bucket” – a little plastic bucket full of cheap Thai whiskey or vodka along with some soda or Red Bull. There’s a reason they give you 5-6 straws with each one – they’re meant to be shared with friends. If you want to try showing off by downing a whole bucket on your own, that’s great, but that’s probably all you need for the entire night. It’s easy to spot the people who had 2-3 buckets, as they’re usually lying face down in the sand before the party really even gets going. Don’t ruin your own clothes. 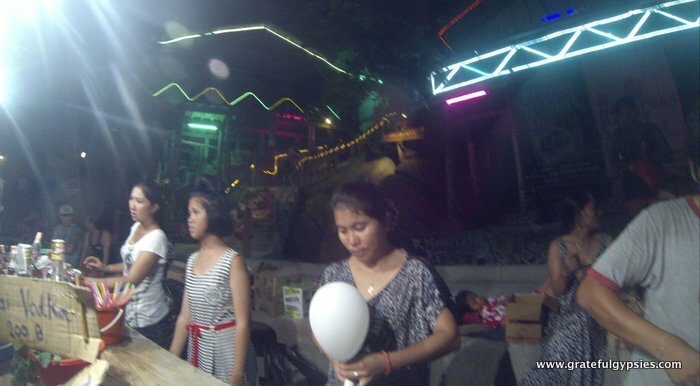 Just about every shop in Ko Pha-Ngan sells a variety of Full Moon Party attire. Before heading to the party, it’s advisable to pick up a neon singlet and/or pair of shorts. For one, they’re cheap and make for a decent souvenir. They’ll also enable you to glow in the dark at the party, which is full of black lights. Finally, should you choose to partake in the body painting, you won’t have to worry about staining your clothes. 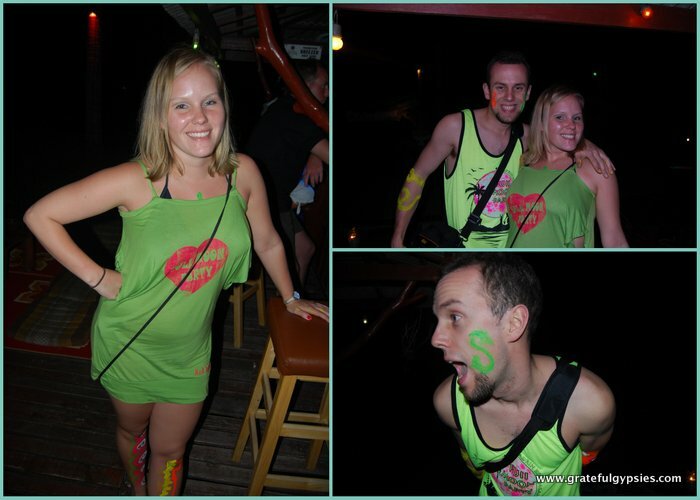 One of my favorite t-shirts and pairs of shorts will forever have neon green paint stains on them – a reminder of a poor wardrobe choice from my first Full Moon Party experience. In the tuk-tuk – the first place you’ll lose something. 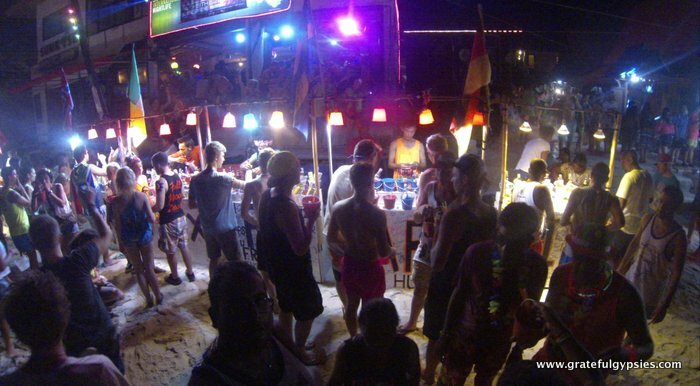 With so many messed up people on one beach at the same time, it should come as no surprise that there are tons of pickpockets who also show up to the Full Moon Party. If you don’t want to risk getting your valuable things stolen, just don’t bring them. Leave your wallet with important cards, your passport, and nice camera back at your hotel with the front desk. Also, do you really need a blurry selfie of you sloppy drunk at a party? I didn’t think so. Might be a good idea to leave that nice new smartphone behind as well. Bring enough cash to get you into the party, buy a few drinks, and get a ride home. Ok, maybe just a balloon. Now I’m not here to lecture you like Mr. Mackey from South Park (“Drugs are bad, mmmkay.”) – I’m all about personal freedom and have no qualms with people doing a bit of recreational chemistry. 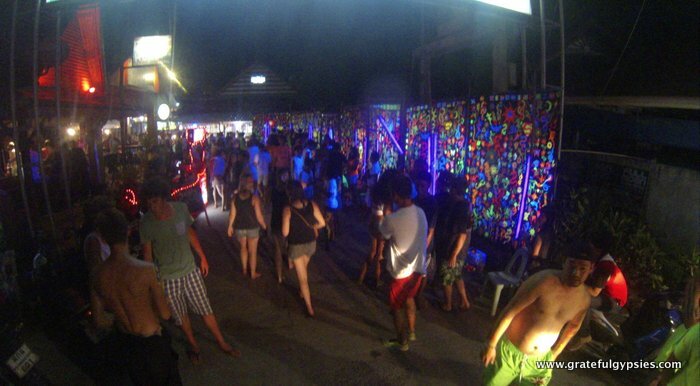 That being said, the Full Moon Party is definitely not the place to buy your drugs. For starters, most of the people on the beach selling those drugs are working directly with local police. You buy a bag of weed or ‘shrooms from one guy and the next thing you know a cop springs out of the bushes. We’ve seen it happen to people both times we went and it’s common knowledge that the police on Ko Pha-Ngan will extort a vast sum of money from you before letting you out. Stick to the legal drugs here, folks. If you really need something other than booze, it’s not hard to find whippets on the beach these days. Keep your bucket in your hands. This is especially true for ladies, but goes for everyone. Throughout the years there have ben numerous cases of party-goers getting their drinks spiked. This leads to robberies, hospitalizations, and rapes. Keep an eye on your drink at all times, and don’t let anybody take it out of your sight. You’re at a huge party on a beach, feeling good, and the ocean is right there in front of you, tempting you to jump in and go for a swim. If you must go into the water, just get your feet wet. The ocean will still be there tomorrow for you to soak in when you’re painfully hungover. You know how the rest of the saying goes. 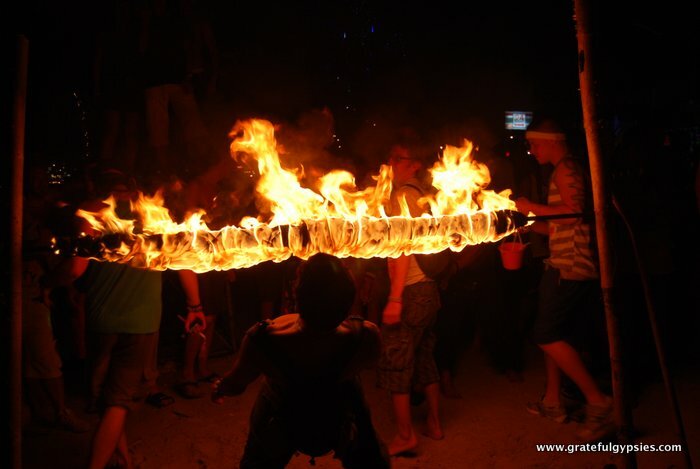 There are plenty of places along the beach where you can partake in fire limbo or jump rope, which might look like a lot of fun after consuming a bucket full of cheap booze. If you’re too drunk to stand up straight, however, it might not be a wise decision to jump over a burning rope. It’s probably better to take home a singlet as a souvenir rather than a 3rd-degree burn. A blurry, but fun night. 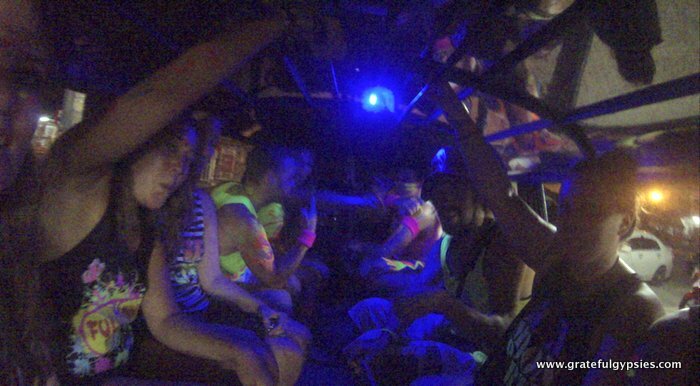 At the end of the day, the Full Moon Party is exactly that – a freakin’ party. People from all over the world converge on a beach once a month to drink, dance, and have a good time. Assuming you follow the nine tips above, you should be able to do just the same. While you’re there, strike up conversations with strangers, give high-fives, and share your bucket with someone (just please don’t put any GHB in it). One day, you can use your Full Moon Party experience to prove to your kids that you were, at some point in time, remotely cool. 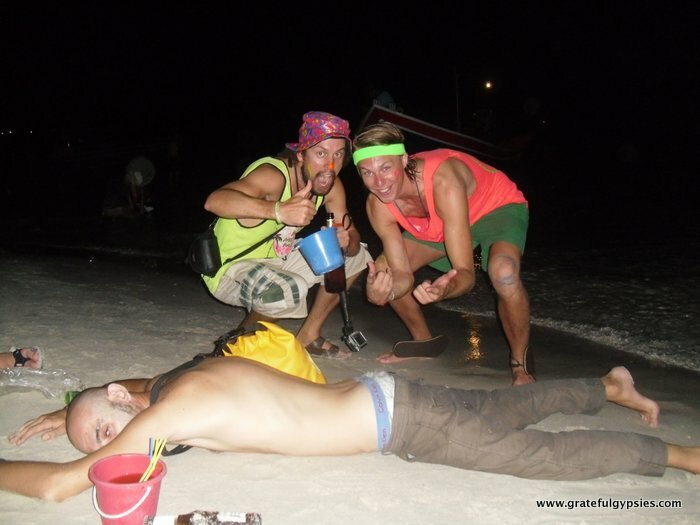 Do you have other tips for the Full Moon Party?